City lights, cocktail parties and that infamous glittering ball. Where else would you rather be on New Year’s Eve? By now, you’re probably thinking about what outfit to wear for such an eventful night. Perhaps the harder choice is deciding which jewelry pieces to complement your outfit. With so many precious stones out there, we feel you. Read on for our roundup of favorite New Year’s Eve jewelry to ring in 2018 right. The most classic of classics is the little black dress, aka LBD, when it comes to formal attire for any social mixer. 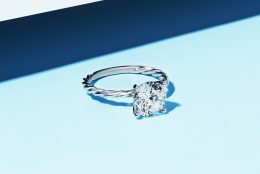 To add some interest, pair it with something unexpected, such as a one-of-a-kind cocktail ring. With an emerald-shaped pink tourmaline and half-moon shaped diamonds surrounding it, this jewel is a bold one for sure. When picking out your New Year’s Eve jewelry, you can’t go wrong with a tennis bracelet. Here, we have a quintessential style with a twist—there’s a flower motif on the clasp. So why not take that idea to the next level? Wear it with a floral printed outfit. The solid color of the white gold complements the busy print of the outfit. It’s easy to just throw on a sparkling silver mini cocktail dress and call it a day, but for those who dream of a brighter New Year’s Eve attire, pair your sequined grown with a bright aquamarine halo necklace. As the diamonds cover all sides of the setting, it’ll catch glimpses of light from every angle. Maybe you got engaged recently and don’t have a ring yet. Hey, spontaneous proposals are sometimes the best ones. It has its perks, too. You can be a part of the ring selection process—something many only dream of. If this is the case, check out the above rose gold pavé twist diamond ring. Plus, it’ll match nicely with just about any New Year’s Eve outfit. We have a thing for rose gold – can you tell? New Year’s Eve jewelry with rubies are a surefire way to make a statement, especially with halo accents around a brilliant diamond. These white gold, ruby and diamond earrings are the perfect New Year’s Eve jewels to go with a deep red ruffled dress. Put on both and channel the Dancing Lady emoji. All eyes will be on you. Going green is always a good idea. Start off the New Year right with a positive mindset by wearing the color that has long been synonymous with luck. Play up the sparkle in this dress by adding a white gold emerald and diamond bracelet. With alternating emeralds and diamonds providing a bold burst of color, who knew perfection could be so easy? A New Year’s Eve jewelry guide is surely not complete without a pair of 14K white gold geometric star pavé diamond studs. Just like looking at the clouds, some may see this six-pointed shape differently, perhaps as more of a snowflake. Either way, when matched with a fancy ensemble, it’s a wondrous look indeed. Going to a friend’s get-together at their home? All the more reason to look effortlessly chic in luxe loungewear. By adding a touch of New Year’s Eve jewelry, you’ll look dressed up in an instant. We say, go for this open swirl blue sapphire and diamond necklace. You don’t see these everyday. Now, get ready for the countdown—this is your year! Which of these New Year’s Eve jewelry pieces do you fancy? Let us know in the comments below or on our social channels: Instagram, Facebook, and Twitter. Subscribe to our email list for access to secret sales, practical ring-buying tips, and $100 off your first order! Wendy is a jewelry-obsessed New Yorker who writes about all things style and beauty.